I’m not often speechless. 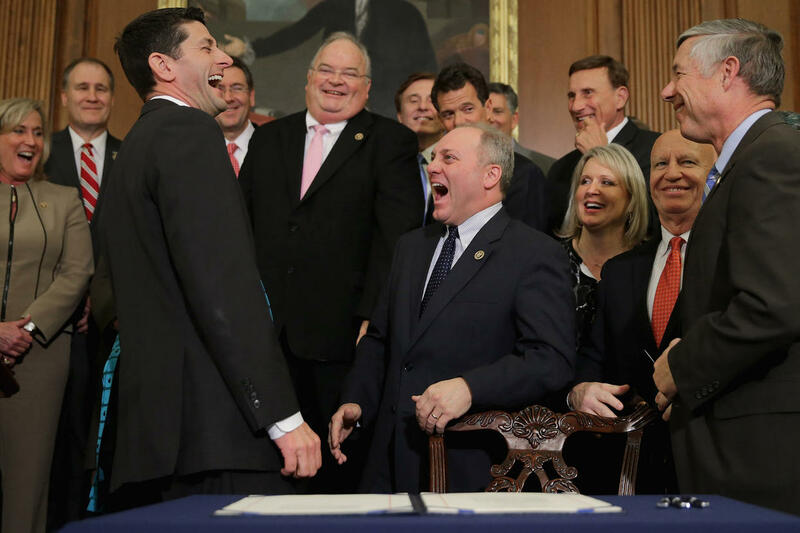 But it’s difficult to put into words what it’s like to watch House Republicans celebrate and slap one another on the back because they passed legislation that, if enacted, will strip health care from 24 million Americans. Both claims, as I’m sure you are aware, are provably false. Maybe we could give them a break for not fully understanding the details of their vote if it were not so consequential. If this vote would not literally cost some people their lives, many others a lifetime of savings, and still more the pain and uncertainty that comes with being un- or under-insured, then maybe I’d give them a pass. But as it stands, nope. And that brings me to the only benefit that I can see from this vote. They can no longer hide. We now have a vote that shows their allegiance and their priority. Now that they’ve shown their true colors, there’s simply no hiding from their constituents. Our job now is to ensure that their voters understand who their representatives really are. So, let them celebrate now. Let them roll in the mud of their so-called victory and ensure that their constituents see the pleasure they get out of hurting Americans while lining their pocketbooks. We’ll get the last laugh. On November 6, 2018. As Napoleon once said – “Men are moved by two levers only: fear and self interest.” This week’s actions are all intended to strike some fear in the GOP. Host a phone bank house party! Swing Left, the Progressive Change Campaign Committee (PCCC), MoveOn.org, Flippable, and Democracy for America (DFA) are asking volunteers to host house parties to make calls to get out the vote. So find a few friends, decide on a date (the launch is May 17), and give a call to voters in Montana. If you are more of a “boots-on-the-ground” kind of person, you can head over to Montana and knock on some doors. Sign up here for more information. If you would rather pitch in a few bucks to help Quist’s campaign combat the gobs of money the GOP is throwing at the race, head here to do just that. Time to call your reps – regardless of their stripes. Scripts are provided for both Republican and Democratic Representatives. And yes, these are blunt. Script (GOP): My name is ____ and I’m a constituent at ____. I’m horrified that Representative ____ voted for the AHCA. Now that I see what kind of person and representative he/she is, I can assure you that I’ll do everything in my power to ensure that this is his/her last term. Please let him/her know that this vote will never be forgotten. I’ll make sure of that. Thanks for your time. Script (DEM): My name is ____ and I’m a constituent at ____. I’m incredibly disappointed in the AHCA vote this week, and want to know what Representative ____ is planning to do about it. I saw that a New York representative – Rep. Maloney – had a town hall in a neighboring Republican district so that he could answer questions about the AHCA. Even though it’s not his district, he went out of his way to help those people. What is your office planning to do to help Americans understand what this legislation does and how it will harm all of us? Let’s face it: Nothing scares a member of Congress more than seeing massive dollar signs in their opponent’s bank account. And nothing seems to scare off a potential democratic candidate more than seeing a steep hill of fundraising to climb. So donating to a Democratic challenger is a great way to send a message. But what if there’s no clear Democratic challenger yet? Enter Swing Left District Funds. Unless otherwise allocated, donations will be split between the 35 Swing Left districts – and the donations will be given to the eventual Democratic nominee. It’s not only a great way to give your next nominee a boost, it’s a great way to send a clear message right now to the GOP. That message is pretty clear: so far Swing Left has raised $1.3 million for their District Funds initiative. Wow! Based upon public reaction to Trumpcare, GOP Senators who had been gleefully awaiting the 2018 midterms because they thought they’d pick up a bunch of seats have some reason to pause. Maybe that’s why the Senate has said that it’s not happy with the House version of Trumpcare and won’t pass it in its current form. So lets keep this kind of citizen pressure up, and this week call your Senators and let them know – you expect them to advocate for and represent you. And this bill hurts all but the wealthiest Americans. Hey – it’s not called Trumpcare for nothing. Script: Hi, my name is _____ and I’m a constituent at _____. Trumpcare would negatively impact all of the citizens of our state. [Enter personal anecdote, like “I’m a woman, which basically means that I am a walking pre-existing condition.”] I’ll be watching what Senator ____ does with regard to this legislation very closely [If your Senator is up for re-election in 2018, add: “and I will do everything in my power to oppose his/her reelection in 2018 if he/she does not protect his/her citizens from this draconian bill.”]. Copyright © 2017 Small Deeds Done, All rights reserved.